Cider is called “seidr” in Welsh. And there has been a lot of seidr enjoyed the last few months! With reason to celebrate Welsh cider after the recent award to Gwyntt Y Ddraig at the International Cider and Perry awards. With more and more small artisan producers emerging onto the competition and festival scene, it’s exciting times for the revival of traditional real cider in Wales. The Welsh Cider and Perry Society is proving to be a catalyst for these producers. The societies aims are to encourage a greater appreciation of these natural craft drinks, spearhead a new era of orchard planting and promote Welsh perry and cider as an indigenous alternative to wine. 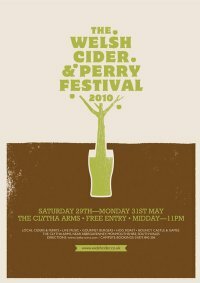 The last bank holiday of May, Welsh cider makers and fans, gather for the annual competition and festival in the grounds of the Clytha Arms in Monmouthshire for the Welsh Cider and Perry festival. I’ve been for many years, and is exciting as the Clytha is a fantastic pub anyway, the festival adds another dimension with around 40 different makers producing many different ciders and perries, and various live bands on to entertain the drinkers throughout the weekend. This years event, despite the rain there was a good turnout. The weather improved on the Sunday and by all accounts it was another successful weekend. Follow @ArfurD for more Welsh Cider updates and the Brew Wales blog. If you want to attend a Welsh cider festival this weekend (10-12th June), get along to Cardiff and the Great Welsh Beer & Cider Festival. Cheers!